What if we told you that market saturation is a myth? I know it may be hard to believe when it feels that every mompreneur you know is also involved in network marketing. The secret to successful networking doesn’t lie in the unique nature of your product, but in the innovative strategy of your marketing. 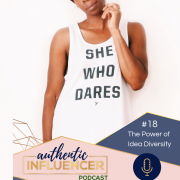 This week on the Authentic Influencer Podcast, we’re talking about how to stand out, make a difference, and utilize ideas that surround you everyday to embrace your movement in a fresh way. The book Great By Choice written by Jim Collins discusses the strategies implemented by the founder of FedEx, Fred Smith. Smith studied the operating methods of military boot camps, and their centralized locations for training, and applied these principles to the delivery of packages. When applying effective concepts to an entirely different industry, the strategy became revolutionary! You have the power to do the same within your own business. To stand out in the market, begin to study practices of successful companies in tangential, or even completely different industries. This could be exactly what you need to stand out in a “saturated” market. Another great way to become more diverse in your business is to find the support of other entrepreneurs and network marketers. Join the Authentic Influencer Marketing Facebook group to surround yourself with other women who desire to present a unique business strategy in the midst of the growing sea of network marketers. Great products and long-term sustainable business models are developed within the context of community. Gaining feedback, and giving space to hone your idea and make adjustments, could give you the necessary edge for success. If you are serious about growing your business, and promoting diversity in your movement, come to the Social Tenacity Workshop this January 22-24. This won’t be a space for hype, or just an event, but a valuable time for you to learn, and grow alongside other entrepreneurs. Visit socialtenacity.com/workshop and enter coupon code AIP for a 20% discount on your ticket!